High Mounted Series heaters are specifically designed for aircraft hangars and very high ceiling installations. Units consist of a steam/hot water (type HMS) or gas heating (type HMG) section along with high performance revolving discharge section for projection and air distribution. Units can be used for mounting heights of up to 120 feet. while maintaining near zero temperature stratification. 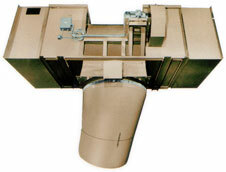 High Mounted Series units are equipped with a backward inclined fan section for high airflow capacity and quiet operation. For more information, request bulletin HMS.